Verdict: Perhaps the most melodic, creative and non-mainstream album ever from them. One thing for sure, it’s definitely their heaviest album yet, just as described by frontman Dave Grohl. I’m sure it has a lot to do with Pat Smear‘s return to the band and with Krist Novoselic as the guest for track 10, “I Should Have Known,” it’s like a Nirvana reunion minus the late legend Kurt Cobain. I’ll be listening to this album over and over again for months ’cause to me, it’s contemporary grunge and alternative rock at its best of the 2010s thus far. 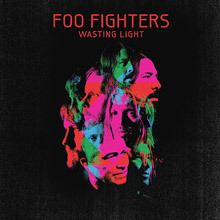 To have had everything recorded in a garage, Wasting Light brings back Nirvana‘s philosophy and art in music. Favourite track: The 4th number, “White Limo.” It’s the heaviest, noisiest and awesomest song on the album to me. How Grohl is still able to scream like this at his age just amazes me. Least favourite track: I actually like all the songs on the album but if I really have to pick one, it’d probably have to be the final track and second single, “Walk” ’cause the intro reminds of Taylor Swift‘s “Love Story.” Walk is one of the more pop-ish, mellow and lyrically positive song on the album. The track can be heard twice on the film, Thor. Second opinion: “How are they gonna top this album?” (Josh Maran, drummer of Malaysian band Seven). Foo Fighters always had a lot to prove. Despite David Grohl's intent to break ties from the shadow of Nirvana, lyrics and song structure for the (newly) quintet were never rocket science, oriented more for the masses than for the exploring connoisseur. That's why after the departure The Colour and the Shape meant, the stagnancy of four subsequent records made the disappointment even more deafening. The same trite of loud/quiet combination and chord progression twisted to all the possible forms called for a rapid change.